The book is every bit as beautiful as I hoped it would be. Kids are sure to be drawn to the glittery burning bush on the front cover. But my prayer is that they’ll be drawn even more to the content. 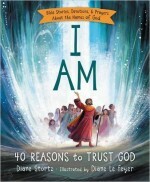 If you’re familiar with my book I AM: 40 Reasons to Trust God, you know I believe that knowing God by his many names in the Bible helps children, and all of us, to trust Him more and more. In that book, I chose 40 names of God and 40 Bible stories that illustrate each one. The I AM Devotional takes those same 40 names and builds 100 devotions just right for kids around their meaning and their application! Knowing God by his many names in the Bible helps children, and all of us, to trust Him more. The devotions feature both modern-day kid situations and the circumstances of Bible characters. Each devotion includes a Bible verse, a prayer, questions for thought and discussion, and a Go Deeper challenge–a related question with a Bible reference for kids to look up to find the answer. And the art–well, let’s just say that illustrator Diane Le Feyer knows how to get a child’s attention! You can view a sampler from the book here. Next week, I’ll share an excerpt or two from the book as well. Creator, God All-Powerful, The LORD Will Provide, The LORD My Shepherd, Son of God, Cornerstone, Bread of Life, I AM … I can’t wait for kids to start getting to know God better by learning about His names! 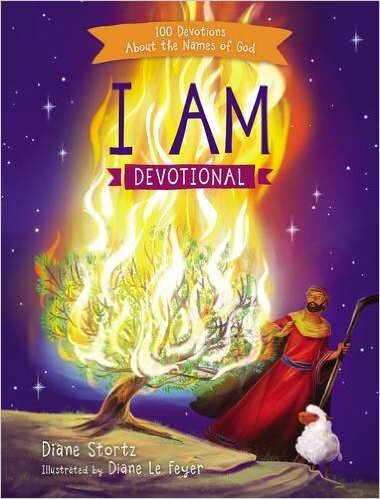 Both I AM: 40 Reasons to Trust God and I AM Devotional: 100 Devotions About the Names of God are published by Tommy Nelson.